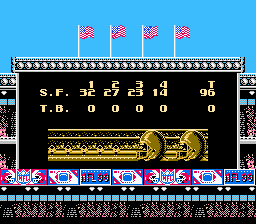 Play Tecmo Super Bowl '99 Roster online with Nintendo NES browser emulation for free! Tecmo Super Bowl '99 Roster is a rom hack of Tecmo Super Bowl (NES). Play it with our flash, java and rgr plugin emulators. Nothing to configure, we've done it for you! 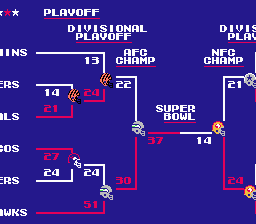 Tecmo Super Bowl is the follow-up to the NES football arcade/simulation Tecmo Bowl. While the basic gameplay of the original is intact, a host of new features and improvements have been added. Features include: 28 real NFL teams/mascots with real NFL players (circa 1991), 11 players on the field per team, player substitutions, fumbles, improved control over kicks and punts, eight plays to choose from during games, customizable playbooks, arcade/coach/computer simulation options for one or two players, pre-season/regular season/Pro-Bowl games, regular season team standings and rankings, regular season player statistics and rankings, end-of-game boxscores, and a 12-team playoff following the NFL format. Oh yea, and as someone else commented earlier half the numbers/letters don't show up. On top of that it says it's 1999 but it's really 1998 in the game. The schedule isn't right either. Sadly, I'm still doing a season because I have to try Warren Moon in Seattle. most of the players. My team is Seattle and most of the black guys are white and most of the white guys are black and they were just given random attributes that don't reflect who the players are at all. Where's the Atlanta Falcons? Lol considering they went to the Super Bowl in 1998 I think they should probably be in the game. Steve Young. Jerry Rice. Game Over. Writing is all broken up for certain things.